You’ve no doubt discovered the difficulty of maintaining a job as a military spouse and the frustrations of finding a new one after each PCS. It took me only two moves before my patience ran thin and I found a job I could handle from the comfort of my home. And if you’re like me, and your last work from home job was the babysitting gig you had when you were 13, it’s possible you’re overwhelmed by Uncle Sam and his rules. While the cash you made on the side as a teenager wasn’t a big deal, your new work from home income is. And the government's tax laws extend beyond the typical workplace to you in your jammies sitting in bed, while you work on a new marketing strategy. And they look a bit different than what you’re used to. When you migrate from the office and set up shop at home, your taxes will change a bit. Self-Employment Taxes. If you’re independently contracted or run your own business, you’ll owe self-employment taxes. Before, your employer would cover half of your federal, state, social security, and medicare taxes and deduct what your owed from your paycheck each month. Without an employer, you’re now responsible for both halves and you’re recommended, and sometimes required, to file estimated quarterly tax using the 1040 form. Telecommuting Taxes. Telecommuting tax laws vary from state to state. Some mandate that your state taxes should be filed in the state where the business is located, while others say that taxes should be filed based on your location. And a few others dictate that the state taxes should be divided between both where the company is located and where you are currently located. Confused yet? This is a vague description, but we’ll talk more about telecommuting tax laws and how they affect military spouses in the next section. Military spouses who live with their service member at their assigned duty station are protected by the Military Spouses Residency Relief Act. In short, the MSRRA says that military spouses are allowed to file their state taxes in their state of residency. Let your employer know that you’re a military spouse. Ask them to adjust the W-4 to not withhold any state tax or request that they withhold your state of residency state taxes. A third option is to wait and file a nonresident state tax return form. For self-employed military spouses or contracted persons who get paid via 1099 form, you can file your residency state taxes. It’s as simple as that. But filing state taxes looks different for military spouses paid via W-2 form and telecommute across state lines. And, unfortunately, there isn’t a perfect pattern to follow. Both the MSRRA and Telecommuting Laws are applicable to military spouses. The problem is, they contradict each other and haven’t yet come up with a solution. Each state has different laws that determine which set of rules you fall under in this particular situation, so it’s best to consult a professional if you fall in this category. Your taxes increase astronomically when you choose to work from home, but you might be eligible for deductions, hooray! In order to qualify for home office deductions, the part of your home you do business must be regular and exclusive and the principal place of your business. In other words, the area you use for work must be a place only for work and not a dual-purpose room. For example, you can’t deduct your office that also serves as an occasional guest room. The deduction also applies to other free-standing structures like a storage unit, garage, or studio. The IRS provides a couple of ways to calculate your home office tax deduction. Regular: Calculate the percentage of your home used for business and total your expenses. Expenses could include your mortgage interest, insurance, utilities, repairs, and depreciation. Simplified: Deduct five dollars per square foot of used space. You can deduct up to 300 dollars, no more. This deduction is simple for the self-employed. Every purchase is a deductible work-related expense. Just be sure to keep an itemized list of purchases. Consider scanning receipts and saving them somewhere on your computer or storing them online. Telecommuters may also claim work-related expenses tax deductions, however, the return has a limit. You can only claim up to 2% of your gross income, so it might be best to ask if your employer will fully reimburse your expenses rather than filing for a tax deduction. If you’re self-employed and don’t participate in an employer-subsidized health care plan, you might qualify for a health insurance tax deduction. However, since you’re a military spouse with access to Tricare, this deduction will likely not apply to you. Transportation, lodging, and food expenses not reimbursed by an employer might qualify for a tax deduction. If you use your car for business, you can use the standard mileage rate or actual expenses to file a tax deduction. If you qualify to use the standard mileage expense method, you’ll use Publication 463 to calculate your deduction. To determine your vehicle deduction using the actual expenses method, you need to total the gas, oil, repairs, tires, insurance, tires, registration fees, depreciation attributable to the business use portion of the vehicle. 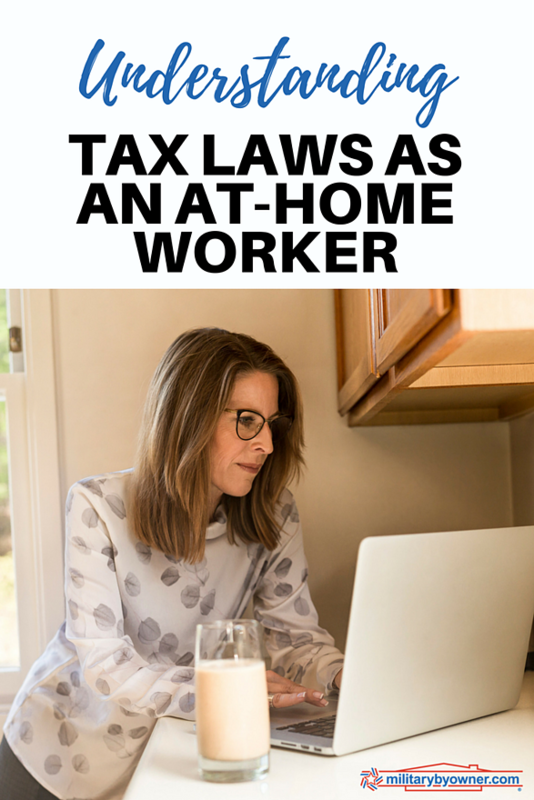 Learning your new tax laws is the least fun adjustment you’ll make as you start your work from home job. My hope is that you now have a better understanding of tax laws, but as I am not a professional, I urge you to seek professional guidance if you have further questions or concerns. To find a military-friendly tax expert, you can visit Military OneSource and use the resources they have available.